Despite our fragmented, on-demand media landscape, live televised music events—from the to the Billboard Music Awards to the Super Bowl halftime show—are experiencing something of a golden age. These and other high-profile music broadcasts are enjoying a serious comeback, with socially connected viewers tuning in and sponsors like Pepsi, Chevrolet and Samsung signing on for what have become some of the buzziest moments in all of entertainment. Not anymore. NBC, American Express and YouTube have all launched live music events, muscling their way onto an already crowded platform—and all are driven by the promise of brand exposure, social chatter and massive audience numbers. Take this year’s Grammy Awards, which on Jan. 26 drew an average 28.5 million viewers, making it one of the venerable broadcast’s best showings in decades. Those eyeballs paid off big for CBS, which charged advertisers as much as $1 million for a 30-second spot. All told, ad revenue for the Grammys—which boasts the second-largest TV audience of any awards show, second only to the Academy Awards—more than doubled between 2010 and 2013, to $67.2 million, per Kantar Media. In fact, the Grammys are closing in on top dog the Oscars, whose ad haul for ABC was an estimated $88.3 million last year. Twitter buzz around live events might actually be of greatest benefit to those advertisers that are not marquee sponsors of the events or those dropping millions on traditional TV spots. While Arby’s also ran local TV spots in more than a dozen markets including Birmingham, Ala., during this year’s Grammys, it didn’t invest in a national ad buy. The company has estimated that it would have required $30 million in paid media to get the attention it earned off just one tweet. In fact, that tweet was so successful at capturing the on-the-fly marketing zeitgeist, it spawned an eyebrow-raising kaleidoscope of meta marketing in the form of retweets from other brands, among them Pepsi. An Arby’s partner and top-five Grammys advertiser, Pepsi this year bought a two-and-a-half-minute commercial block during the awards show dubbed “The Grammys Halftime Show,” to drive awareness of—and squeeze value from—its sponsorship of the single highest-profile live music moment of the year, the Super Bowl halftime show. Besides the Super Bowl and the Grammys, Pepsi also has forged relationships with the CMAs, the Billboard Latin Music Awards and the CMT Music Awards. Around last year’s VMAs, it partnered with MTV, Twitter and Katy Perry to build buzz leading up to the release of a new track from the singer—who boasts nearly 52 million Twitter followers, more than any other person. It’s no wonder brands are eager to play in the live music space—good news for a music business decimated by the rise of digital media. Sponsorship of music venues, festivals and tours by North American companies (not including ad time bought during televised music events) is estimated to grow this year by 4.4 percent to $1.34 billion, per IEG. Much of that comes from soda marketers, which are nearly 10 times more likely to sponsor music events than companies in other categories—with Coca-Cola particularly active in venues and tours, and Pepsi in festivals. Undoubtedly more brands will link up with events, as data suggests live music experiences drive better returns for advertisers than other types of events. A survey by IPG event marketing agency Momentum found that attending a branded live event—in person, not via telecasts or streaming—was most likely to drive recommendations (65 percent of respondents) and purchases (59 percent) compared to TV commercials, websites, even recommendations from friends. Respondents were also most likely to appreciate music events, with 51 percent indicating they made them feel positive about brands, versus 45 percent for sports events, 42 percent for charity events and 28 percent for art exhibitions. There’s clearly no dearth of opportunity for brands to make beautiful music with these events. In February, NBC and Clear Channel announced the debut of the iHeartRadio Music Awards, produced by Ryan Seacrest, on May 1, just before the Billboard Music Awards are set to air on ABC on May 18. 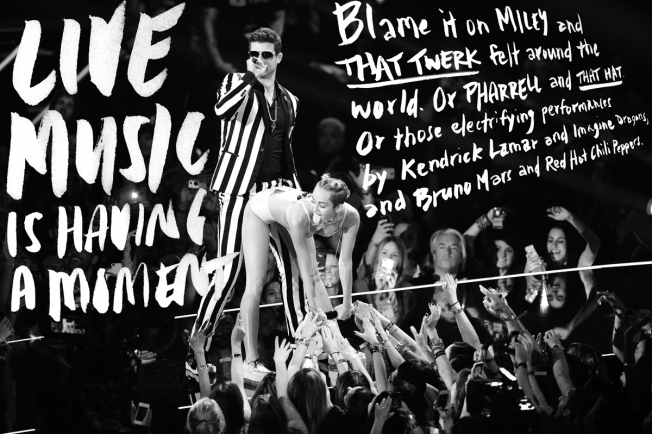 Music awards shows have even earned themselves a parody. In March, IFC announced the premiere next year of the Comedy Music Awards, produced with CollegeHumor and featuring live performances—one small network’s offbeat attempt to grab a slice of what’s become a rich pie. Of course, as some have learned the hard way, attracting a sizable live audience can be a challenge, especially when you’re just starting out. Last fall marked the inaugural YouTube Music Awards, which featured performances by the likes of Eminem and Lady Gaga and was sponsored by Kia (also a sponsor of the VMAs). YouTube users cast some 60 million votes to determine winners of the awards, and yet a mere 215,000 concurrent viewers reportedly tuned into the livestream at its peak. YouTube declined to say whether it will reprise the franchise this year. It stresses there were 40 million views for the show’s on-demand content, 30 million of them in the week following the livestream. Although plenty of brands—among them, State Farm, T-Mobile, Dell, Motorola, Wrigley and Budweiser—have livestreamed concerts and festivals on YouTube, American Express stands out for building a proprietary series around it. Since 2010, AmEx has presented 15 live musical shows through YouTube and Vevo as part of its “Unstaged” campaign, meant to extend to a broader audience the kind of access to concerts it has historically secured for card members. Agencies Digitas, Momentum and PMK•BNC have been involved in “Unstaged” since it began, and@radical.media came on board last year. The American Express campaign includes a 2011 Coldplay concert, directed by Anton Corbijn, that continues to hold the record for a livestream of a single artist’s performance on the platform (some 19 million views). Late last year, the brand expanded the franchise—previously focused on musical artists and directors—to pair fashion designers with musical artists, presenting Janelle Monáe live during a Fashion Week show for Rebecca Minkoff, a strategy it reprised earlier this year with a St. Vincent-Diane von Furstenberg mashup. Social-savvy AmEx doesn’t currently sponsor or buy media during the Grammys, and says it evaluates its role in other such programs on a one-off basis. But its focus seems fixed on live-streaming its own events, even taking the strategy beyond “Unstaged,” particularly in the launch of new products. In 2012, the company sponsored a Jay-Z performance at South by Southwest, streamed on YouTube, to promote its Twitter Sync rewards program. In June, it will livestream a concert featuring Maroon 5 as part of its “Everyday Moments” campaign, supporting a new, no-fee credit card meant to encourage small, frequent purchases. Despite the allure of streaming, nothing quite delivers like the live televised event, with social providing pitch-perfect harmony. At least, until the next show rolls around.